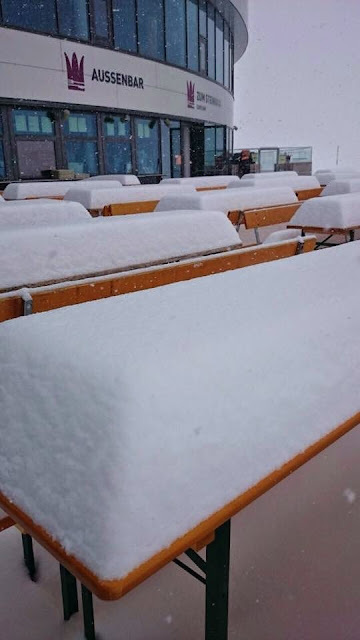 The coming long weekend is the 'final blowout' of the season at a number of top resorts around the world and several have enjoyed heavy snow in the last 24 hours meaning it could be a powdery one. 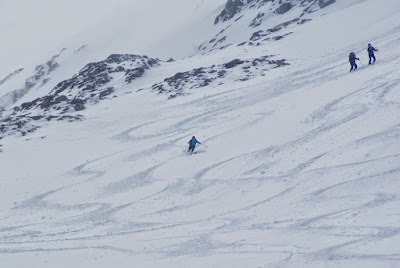 In Austria higher slopes reported up to 15cm of fresh powder this morning (Thursday April 30th) and are said to be in excellent shape for the start of May. The Stubai (pictured above this morning), Kitzsteinhorn, Pitztal, Molltal, Hintertax and Kaunertal glaciers are all open, and it's the big closing weekend of the long season at Ischgl. French resorts have reported up to 40cm of fresh snow (at Chamonix) in the last week with up to 10cm in the past few days. Val Thorens and the Espace Killy were also beneficiaries. In Italy there were similar falls at Cervinia (also on its final weekend of the season) and year-round Zermatt reported fresh snow too. In Scotland nightly snowfalls at Glencoe (pictured below on Tuesday) have led to powder conditions for its final weekend of the season. There was great excitement in Scottish media when an obscure Australian ski magazine posted in its social media that Scotland currently has the world's best snow conditions. There's been fresh snow in Scandinavia too with the Norwegian resort of Narvik reporting 20cm of new snow falling ion 24 hour on Wednesday. The first of Norway's three summer glacier areas, Folgefonn, opens on Friday, May 1st for the season and is reporting an 8m snow base! It is also nearing 24 hour daylight at Riksgransen in Northern Sweden where skiing under the midnight sun will begin in a few weeks' time.